Temporary Exhibition at the Bradman Museum | The International Cricket Hall of Fame. The Bradman Museum’s newest temporary exhibition Courage, Honour, Determination: Australian War Service and Cricket 1899-2015 pays tribute to all those cricketers who enlisted in military service from the Boer War to recent conflicts. There are many forgotten stories of Australian cricketers. Three Test players laid down their lives in service to Australia. 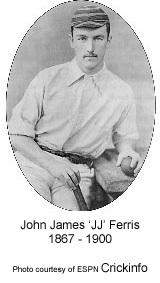 John James Ferris played nine Tests before serving King and Country in the Boer War. Albert ‘Tibby’ Cotter was at the peak of his fame as a fierce bowler when he enlisted during World War One and unfortunately never made it home. Ross Gerald Gregory, after playing two Tests, was told by Bradman that his time in the national team would come. However the Second World War intervened and the cricketing world lost another talented player. In honour of the centenary of Gallipoli the exhibition also pays tribute to Charles Backman. A First Class cricketer who played for South Australia Backman died in the early hours of the first day of the Gallipoli campaign on 25th April 1915. Courage, Honour, Determination recognises all those Test cricketers to have served and a commemorative honour board has been specially prepared.